I wanted to take a few moments to give you a bit of feedback about the new Designer Series Pole Dock your team built and installed for us last spring. I am more than happy to report that the new dock came through our very wet and icy Muskoka winter absolutely unscathed. 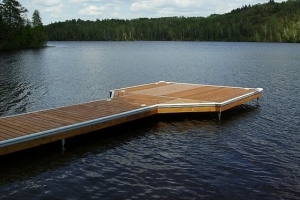 After years of shimming, adjusting and repairing our old crib dock, moving ahead with an On the Water Design’s dock is a decision that I wish I had made years ago.